There is a small but important distinction of definition between dissolving views and effect slides. Dissolving views, as the name implies, dissolve into each other. For this effect we need two lanterns, or a double- or triple-lantern because there are at least two pictures to display at the same time to achieve the gradual changeover; for example one slide depicting a landscape in summer, the other the same landscape in winter. The pictures are broadly speaking the same. They overlap each other completely. Effect slides however superimpose a special effect over a scene. 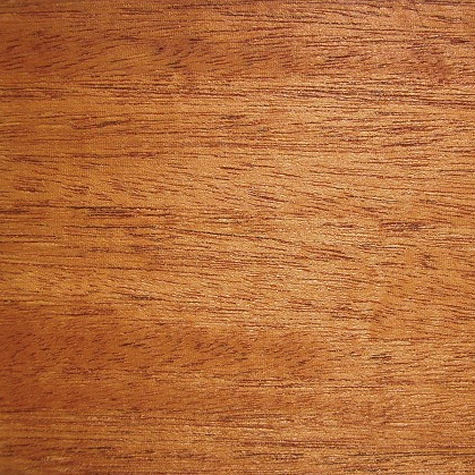 Popular effects include rainbows, dreams and visions, fires, and angelic or ghostly apparitions. Well-known effect slide sets are 'A soldiers dream' were a wounded soldier at the front is dreaming of his beloved family at home, and 'Tower of London on Fire'. Also some Life Model slide sets make use of those effects. When Jane Conquest is praying for strength and inspiration, an angel appears in her cottage room. The two or more slides that we use for such an effect are quite different. We distinguish a slide with the scene, e.g. the battlefield with the sleeping soldier, and the slide with the object that has to be superimposed, in this case the dream. Set of effect slides of 'The Sculptor's Dream'. 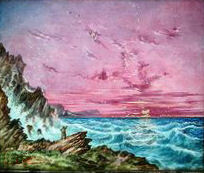 Framed in mahogany, c. late 19thC. Size: 7 x 4 x 3/8"; Glass: 3" diameter. A lovely set of effect slides 'The Cross', fitted in wooden frames measuring 18 x 11.5 cm. 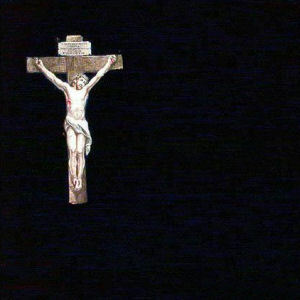 Marie Magdalene and Christ crucified. The Vision. 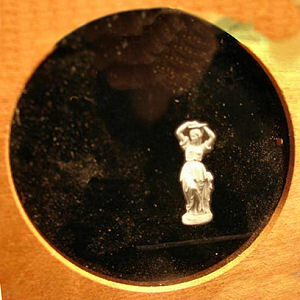 A combination of a normal square magic lantern slide with a sleeping woman, and an effect slide with the image of a group of angels that appears to her in her dreams (above). The image to the right shows the projection. Of course the use of effect slides required a lot of dexterity of the lanternist. The lenses of the multiple lanterns had to be inclined slightly relative to each other so that the images coincided on the screen. Aligning lenses was best achieved by the projection of special registration slides. Very large effect set (29.2 x 24.5 cm !). 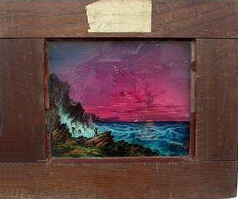 Set of two hand painted magic lantern effect slides in mahogany frames showing a polar expedition, complete with some natural phenomena, like St. Elmusfire. The effect is shown on the pictures below. 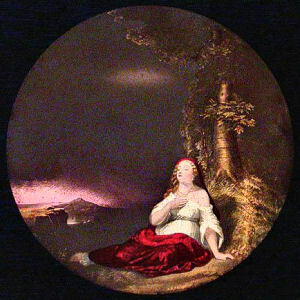 The picture is painted on a glass panel, which is framed together with another panel that protects the painted side. The second slide is made the same way but it additional has a hinged tin panel, painted black, which is used to either cover the top or bottom half of the slide. 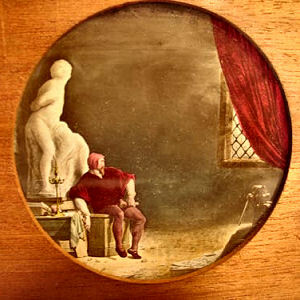 There are a lot of series of magic lantern slides that use effect slides. The Better Land. Marley's Ghost. Dickens. Gabriel Grub.